Brambles - includes raspberries, blackberries, boysenberries. etc. This is a long article - so if you just want to cut to the chase, check out the OGG Berry Shortlist of best varieties. Some red raspberry varieties have long, slender canes that must be tied. They can be staked or tied to a trellis. Set the trellis posts at either end of your raspberry row apart and run wires between them. Most red raspberry varieties are stout caned and can be planted in hills without training them to stakes. The wires will just support the boughs when laden with fruit. To build a trellis for boysenberries, use 4 by 5 inch or larger timbers for the end posts (2 by 2 posts with braces works as well). Use 6 foot long 2 by 2 inch wide grape stakes in between the posts at 20 foot intervals, and set them 18" in the ground. 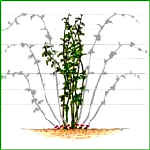 For ollalies build a 4 to 5 foot trellis and run the first wire 1.5' from the ground, the second wire one foot above the first, and so on, similar to that used for grapes. Raspberry canes are biennial; they grow the first year, fruit the second, then die. Only the crown and the roots are perennial. Old canes should be removed as soon as the fruit is harvested. New canes grow from buds on the base of the old canes. Two new shoots usually come up each year. In addition, suckers grow directly from the roots of red raspberries. The new canes and suckers should be thinned immediately after harvest. Blackberries should be pruned as soon as the harvest is completed. All wood that has produced the current crop should be removed. The berries should be trellised immediately after pruning. Put up only the larger canes and prune the small ones. Generally, no more than 9 canes per plant should be kept. A fan like arrangement is the best way to trellis the vines. The fruiting wood (canes about 6 to 8 long) is spread out over the wire. Put them over the top wire, wrap them around the middle wire, and then remove the tip. In coastal areas where canes are 10 to 12 feet long, they are taken over and under the top and middle wires three or four times - this is referred to as the barrel roll. Tipping (removing the growing end of the canes) forces out the laterals on which fruits will be borne the following season. A cane that is not tipped will continue growing. The farther berries are from the crown of the plant, the smaller they will be. Winter pruning is done around Thanksgiving; prune to remove all laterals below the lower wire and cut back the long laterals at the top of the trellis to 12 to 15 inches. Prune in spring before new growth starts. In March, fruit buds are easily recognizable, as they are plumper than vegetative buds. For the first growing season, all of these fruit buds should be removed. This forces vegetative growth in the plant. This first year should be spent establishing the plant. See the illustrations below showing a mature blueberry, currant or gooseberry plant before and after pruning. To prune, first remove small spindly branches and canes that lie on the ground. When thinning canes, try to maximize light conditions inside the plant by removing the centermost canes, which block the sunlight. Once the plant is mature (6 years old), it should be producing three to five new shoots per year. If it is not, check your fertilizer program. The production of new shoots is somewhat cultivar dependent, and some may not respond as well as others. Every year, select the best two to three new canes to retain. After 5 years, begin removing the oldest (5 years or older) canes while retaining the three best new canes. This will result in a plant that has two to three canes each of new, 1-, 2-, 3-, and 4-year-old canes, or 10 to 15 canes. As with any biological system, this is an optimal range; many plants will deviate from this ideal. Before and after pruning blueberries, gooseberries or currants. These smooth-skinned berries all need to have an "open" center to avoid fungus problems and to allow sunlight to filter through. Red currants and gooseberries produce fruit at the base of 1-year-old wood, with the greatest production on spurs of 2 to 3 year old wood. After 3 or 4 years, the older wood becomes less productive and therefore should be replaced gradually with young shoots by a thinning and renewal process. Black currants produce the best fruit on wood that is 1 year old, although this wood is supported by the 2- to 3-year-old shoots. All canes older than 3 years old should be removed to encourage the growth of new canes. Prune dormant plants in early spring just before growth starts. Remove canes that drop on the soil or canes that shade out the center of the plant. After the first season of growth, remove all but six to eight of the most vigorous shoots. After the second season, retain four or five 1-year-old shoots and three or four 2 year old canes. After the third season, keep three or four canes each of 1, 2, and 3 year old wood. In subsequent years, remove all of the oldest canes, replacing them annually with new canes. Berries should be picked in the morning after the dew has evaporated. If picked in the afternoon, the berries will take longer to cool down, which shortens their shelf life. Blackberries and raspberries should be picked when they are plump, sweet, fully colored and can be easily pulled off the stem. Different varieties may produce berries at different times, providing a longer harvesting period. 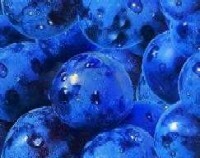 Blueberries turn blue 3 to 4 days before they attain maximum sweetness and flavor. They should be picked every 7 to 10 days. Do not pick berries with a reddish tinge, since they are under-ripe. Currants and gooseberries should be picked with they are fully colored, usually beginning the end of June and continuing into July. Below are the pests and diseases that most often affect berries, and treatments for them.